When the topic of American landscape painting comes to mind, people are quick to associate this genre with the likes of Thomas Cole, Asher Brown Durand, and Thomas Doughty. 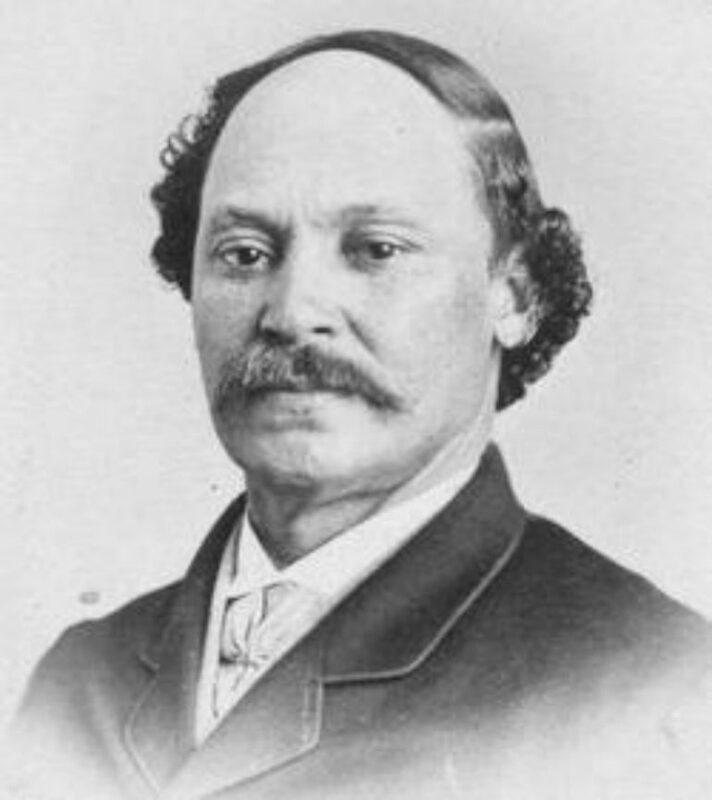 However, one artist that has largely been forgotten in history until recently is the African-American landscape painter Robert S. Duncanson, who was known in 19th century America as “the greatest landscape painter in the West”. Robert S. Duncanson was born in 1821 in Seneca County, New York He had an African-American mother and a Scottish-Canadian father. He spent his youth in Canada, where his father made a living as a carpenter and housepainter and often enlisted his son’s help in working with ornate trims and signs. At the age of 17, Duncanson had become sufficiently skilled to open his own business, focusing on painting and glazing window trims. A strong desire to do more than paint houses pushed Duncanson to move to Cincinnati, Ohio in 1841. Having received no formal training, he taught himself by first copying prints and portraits and later moving on to creating original still-life paintings. 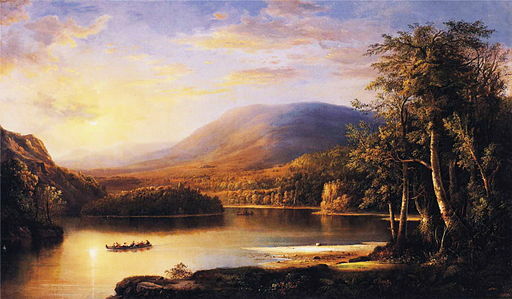 Inspired by the works of Thomas Cole, he eventually shifted his focus to landscape paintings, which were often quite romantic and picturesque, a style heavily associated with Cole’s Hudson River School. In 1848, Duncanson received his big break through a commission by clergyman Charles Avery. His painting entitled Cliff Mine, Lake Superior helped establish his reputation as one of the most important painters in the region. Avery, a known abolitionist, introduced Duncanson to other abolitionists who gave him a steady supply of work. This also led to Duncanson supporting the abolitionist cause and donating several of his paintings over the years. 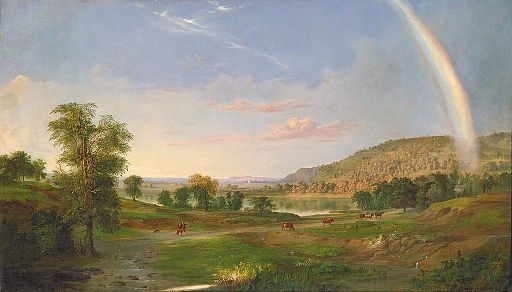 Nicholas Longworth, a wealthy landowner in Cincinnati, commissioned Duncanson to create eight landscape murals to decorate his family estate called Belmont in 1851. The estate is now the Taft Museum of Art, and his large murals are still on display. This was the biggest project in Duncanson’s career, and the proceeds allowed him to finance a grand tour of Europe in 1853. Joined by William Louis Sonntag, he traveled for nine months and visited countries such as England, France and Italy, all of which had strong influences on Duncanson’s style and his future works. His painting entitled Landscape with Rainbow was very similar in style to that of the French artist Claude Lorrain. He also met the famous poet Alfred Lord Tennyson in England, who inspired the painting Land of the Lotus Eaters, considered by critics as his greatest work of all time. This was later purchased by the King of Sweden. He returned to America but the start of the Civil War in 1861 found Duncanson back in Europe. In what was to be the last decade of his life, he continued creating landscape paintings, his last masterpiece being an 1871 painting entitled Ellen’s Isle, Loch Katrine. He died on December 2, 1872 in Detroit, Michigan, after suffering from dementia in his later years. 2nd image by Robert S. Duncanson [Public domain], via Wikimedia Commons. 3rd image by Robert S. Duncanson [Public domain], via Wikimedia Commons.